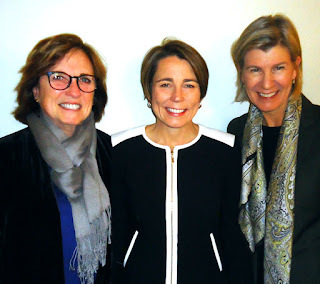 Arline Isaacson, President at Isaacson Political Consulting & Co-Chair Massachusetts Gay & Lesbian Political Caucus along with Massachusetts Attorney General Maura Healey attended a very special cocktail party benefiting LPAC the only national Political Action Committee whose mission is to build the political power of LGBTQ women. Stephanie Sandberg, LPAC Executive Director stated, “I was so honored to be in Boston with LPAC tonight, particularly with Maura Healey -- who both personifies LPAC's mission & is such a passionate advocate for our work. We were happy to also have so many supporters who turned out to support our mission as well! Building a political voice for LGBTQ women is easier when the community has your back & Elyse Cherry is of course the consummate host!” Also in attendance were LPAC Board Members Diane Felicio & Shari Weiner & hosting the event included Elyse Cherry, Jan Donley, Joanna Hochman, Jeanne Leszczynski & Diane DiCarlo. This is a very exciting time for LPAC with 4 lesbian mayoral candidates positioned to win their run-off or critical primary elections in April that would make LGBTQ history. Three mayoral candidates Lori Lightfoot in Chicago, Satya Rhodes-Conway in Madison, Wisconsin & Jolie Justus in Kansas City have elections on April 2nd & on April 23rd Jane Castor will compete in a run-off that will decide the next mayor of Tampa. The next LPAC special event takes place on April 11th when Laura Ricketts, Chair of the LPC Board & her wife Brooke Skinner Ricketts will host a cocktail reception & baseball game to benefit LPAC at Wrigley Field in Chicago.